In May 1997, the Vishwa Ayurved Parishad (VAP) was formed by certain Ayurveda devotees with the divine aim of re-establishing knowledge of Ayurveda among common people. Parishad started its activities among Ayurvedic Scholars, Practitioners, Teachers, Students, Ayurvedic Drug Manufacturers, Farmers who are involved in herbal farming and Common Ayurveda Lovers who are taking active part in growth of Ayurveda. In 1997, Vishwa Ayurved Parishad (VAP) came into existence to re-establish the Glory of Ayurveda in the present era and to facilitate the acceptance and recognition for Ayurveda. 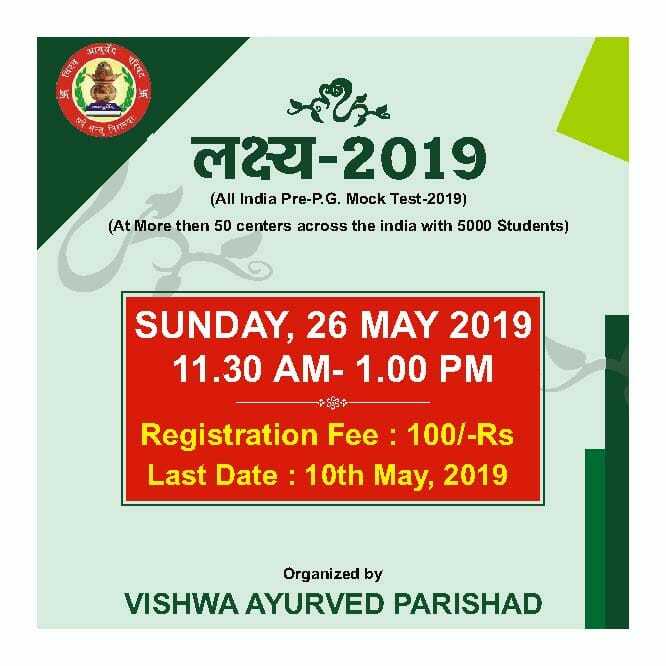 Lakshy is very popular and unique initiative of Vishwa Ayurveda Parishad for conducting Pre PG mock entrance examination for ayurveda post graduate courses. This examination is conducted on all india level and students enroll themselves for real time examination to test their preparation and ability before the actual entrance test. Vishwa Ayurved Parishad Journals are a good source of primary information about Ayurveda. They are published on a regular basis (usually quarterly or monthly).